Zorbing Bangalore is indeed a fun activity. Zorbing is a new-age recreational adventure sport where the rider gets into an inflatable, transparent ball called ‘zorb’ and roll down either on a gentle slope on a level surface. Unlike foreign countries, like New Zealand where the sport originated, Zorbing in Bangalore is generally performed on water. Water Zorbing in Bangalore is a good way to have a stress-free time to relax and rejuvenate. 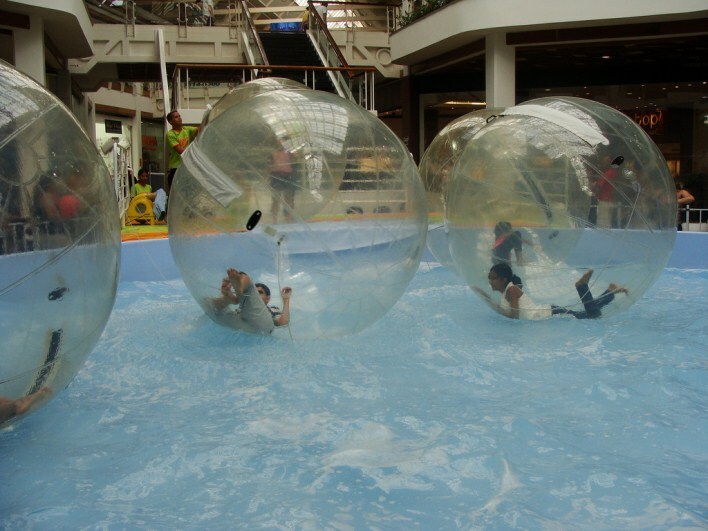 There are generally two types of Water Zorbing available in Bangalore. i.e. Hydro Zorbing and Harness Zorbing. Hydro Zorbing: In hydro zorbing, water is added into the ball making the experience even more enthralling, as the rider moves to and fro. Harness Zorbing: As the name suggests, in harness zorbing, the rider is safely harnessed, generally at the shoulder, hips and feet. Zorbing in Bangalore is also being organized by certain adventure sports organizers especially those with water sports facilities. Resorts and hotels too arrange for this facility for interested guests.